"This is an opportunity to connect with the fans and listen to what they want to see as well as presenting them with our vision." For years we've been hearing about projects and adaptations inspired by Heavy Metal, the badass sci-fi/fantasy magazine, but none of have ever come to fruition. Many fans may recall the classic 1981 Heavy Metal animated movie, but there hasn't been an updated take yet. However, according to a report by Variety, Heavy Metal is "looking to make a significant splash at this year's Comic-Con" and that includes revealing art from Mondo that is the first teaser poster for "the reboot of the Heavy Metal movie". The only other details mentioned in the Variety article pertaining to the movie bounce between the old 1981 version and whatever else they're cooking up. It mentions the "reboot of the Heavy Metal movie", but no mention of Robert Rodriguez. 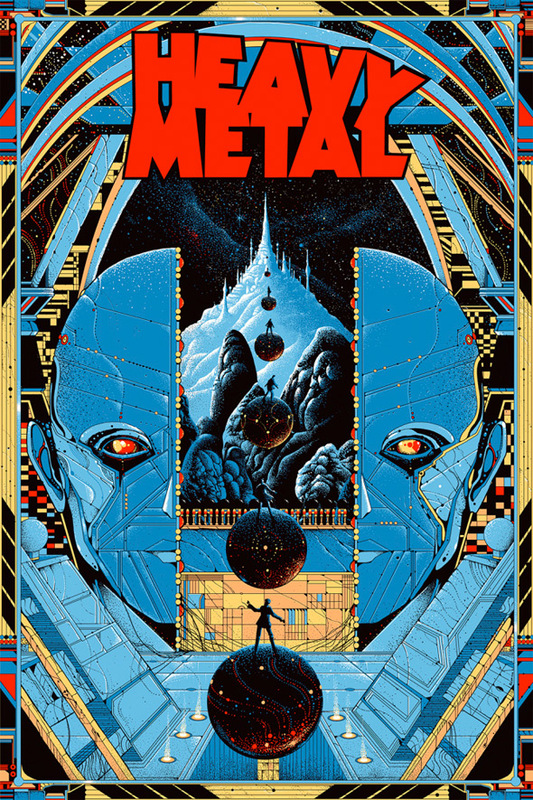 It also says Heavy Metal is making an animated movie "of a Mondo print", based on the artwork. Could this be the same thing or something else entirely? Heavy Metal is also making a series of action figures based on the 1981 film and characters. "The figures were designed as if the movie was coming out today," they say, "as a way to showcase its love of its history as an art and comics touchstone." Back at Comic-Con in 2011, Robert Rodriguez teased plans for a new Heavy Metal remake/reboot. In our coverage: "At the panel we were shown quick looks at a new rendered logo featuring familiar Heavy Metal art including new glimpses at RanXeros and Druuna, two characters from the original film. The footage was accompanied by a new cover of Sammy Hagar's Heavy Metal from Robert Rodriguez's own band." No word, yet, if this is the same movie now being teased by this poster art (above), but we're hoping it's all connected and actually in the works coming soon. I'm tired of waiting endlessly when this artwork looks so damn good. As long as it's not CG, right? Astronaut driving a corvett into the Earth's atmosphere...need I say more? It's about time they make another movie. I am a big Heavy Metal fan of the magazines and artwork. I would love to see them redo the original - cutting out a few things and improving all the animation. The last segment is still classic to me.